There was a time when it seemed that every other single musician and band coming over the radio and over the transom had pretty much scuttled guitars as the centerpiece of pop music , preferring cascading and eliding keyboards, pianos and synthesizers both, as the preferred means to make listeners that music was no longer about Chuck Berry or Bachman Turner Overdrive. Welcome to the mid seventies, when matters of melody became serious, grandiose, bands like Yes, Emerson Lake and Palmer, Kansas and even the power trio likes of Rush committing their resources to tricky time signatures,abrupt changes of tone and style, obligatory faux-orchestral atmospherics courtesy of the Moog and mini Moog synthesizers, and certainly, a surfeit of excessively earnest lyrics obsessed with sci fi themes or else wallowing in the shallow end of the pool of deep thought. Pretentious in other words. Not that pleasures were absent, though, as I had my share of record review rants proclaiming that rock and roll had grown up,matured, had become a “legitimate” art form, ready for the concert hall and the canon.Nothing stings like 20–20 hindsight, of course, and let us say that the music of many an art rocker had not traveled well into the 21st century, sunk by their own pretensions and, most damningly, by producing music that was all parts with no sum to add up to. 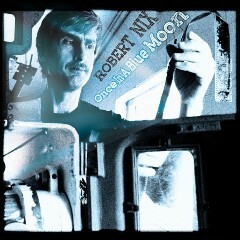 Save for Zappa , King Crimson, and the blessedly wonderful song-emphasis of Peter Gabriel era Genesis, so much of the era’s classically -slanted music was a disorganized , bloated mess, all arrangements and no music you’d care to pay attention to.Robert Nix, a multi-instrumentalist and composer besides, isn’t about to let the genre fade into pop music history with a reputation for grand-scale naivete . He brings impressive musical muscle, which is to say musical ideas to his new album Once in a Blue Moon ; Nix as composer has a superb grasp of the dissonant, the quarter phrase, the angular progression, the means where melody approaches the atonal to emphasize a lyrics message or mood, dense chords from guitars and a crucially compact compression of keyboard textures to heighten the mood of the lyrical ruminations. There is a sense of disruption in Nix’s music, the pacing is tricky and sufficiently abstracted, but there is a strong evidence here that the artist has studied contemporary theatrical musicals along the lines of Sweeney Todd ; Nix is not thematic , or as thematic, as the narratives that make their way to the proscenium , as his songs are stand-alone testimonials, but there is form and integration in his outlay, where his vocals, a bit thin and reedy but effectively talk -sung and multi-tracked, clash and reconcile with the contraction and release of the ever-active arrangements. The album moves forward, the music spirals, recoils and continually renews itself. There is no lack of buzzing activity , there is not a moment when you get a sense of the composer offering up a bit of gussied up mood music so he might have a seat and congratulate himself for being serious. Nix keeps it hopping, as in a masterfully calculated track “I Will Not Go With The Flow”;cooly detached one moment that then evolves to matters suggesting a musical variation of cubism, a kind of sound that seems to unfold and reshape itself so the many sorts of nuances and attitudes of the tunes are exposed simultaneously, a personality arguing with itself.